Race the scenic route up and down the Canning River. 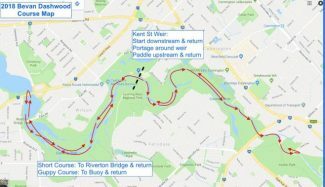 Kent St Weir downstream to Leach Highway Bridge & return, shortcut only permitted on the return leg, portage around the weir, up to Hester Park, back to Kent St Weir. Kent St Weir to Shelley Bridge & return, shortcut only permitted on the return leg.